President Muhammadu Buhari warmly felicitates with Africa's renowned businessman and philanthropist, Alhaji Aliko Dangote, on his 60th birthday. President Buhari joins the business world, Dangote's friends and family in congratulating the Forbes' rated richest African and black man for his patriotism and kind heartedness in always making sacrifices to safeguard the health of the nation, most remarkably the polio and Ebola interventions. The President believes the global business mogul remains a shining example of the virtues of choosing entrepreneurship from an early age, treading the path of diligence, perseverance and continuous learning to build some of the world's largest manufacturing and distribution companies, with household names in Nigeria and beyond. As Dangote clocks 60, President Buhari commends the humility, simplicity and cosmopolitan outlook of the entrepreneur who defies ethnic and religious persuasions in extending support to the poor and vulnerable, providing employment opportunities without discrimination, while inspiring and mentoring young Nigerians to greatness. The President acknowledges Dangote's role in bolstering the economy through continuous engagement and counseling of governments on best practices in promoting the ease of doing business. 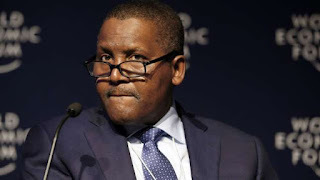 He prays that the almighty God will grant Dangote more wisdom, good health and longer life to serve his country and humanity.